Sealed, 0.8" pitch, dry-air 6U chassis that incorporates extended cooling fins, 18/20 super conducting heat pipes & air re-circulation fans inside. This Zero maintenance ATR is ideal for medium wattage applications where ambient air is laden with hostile or harmful contaminants. 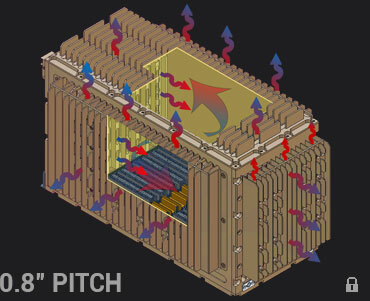 Heat generated within the enclosure is dissipated by a combination of conduction, radiation and free-air convection through the chassis metalwork & double wall extended fins to the ambient environment. 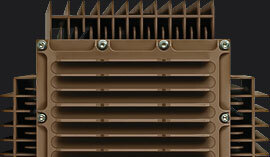 18/20 integrated heat pipes provide fast passage for heat to exit the internal card-cage. 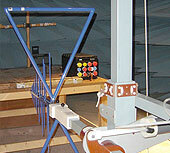 Internal air recirculation fans ensure constant airflow across modules. The 6U SEF-HP chassis is available in 5, 7, & 12 slot versions ( ½ ATR, ¾ ATR, 1 ATR), supporting VME, cPCI, VPX, VPX-VME & cPCI-VME hybrid backplanes. A total PSU power of up to 1050 watts may be installed. Custom modifications can be designed upon request. Internal layout is divided into 3 independent metallic partitions. 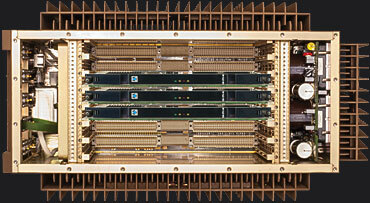 I/O section at the front, card-cage in the middle & PSU section at the rear. This improves EMI/EMC performance & reduces PSU noise on system electronics. Attention to I/O flexibility and easy board integration; allowing the intermixing of wedgelock IEEE P1101.2 conduction cooled boards, IEC-297 air cooled modules, Compact PCI 1101.1/IEC/118/ CD and VPX VITA 46.0/.1/.10/.3/.4/.7 air cooled boards. Slots / Pitch:5 | 7 | 12 0.8"
The 6U SEF-HP chassis is suitable for medium wattage sealed applications that demand high passive cooling capability. This silent, fanless model is competitive vs forced air ATRs & ideal for submarine, proximity to operator, deploy & forget applications. ΔT/W = 0.16°C (½ ATR) | 0.13°C (¾ ATR) | 0.10°C (1 ATR) . 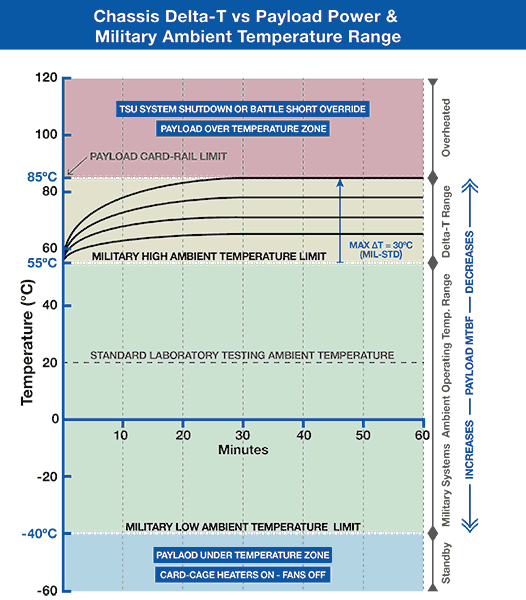 ΔT/W = 0.165°C (½ ATR) | 0.135°C (¾ ATR) | 0.105°C (1 ATR) . For reliable operation it is recommended the maximum Payload Power not be exceeded. Subject to operating conditions. 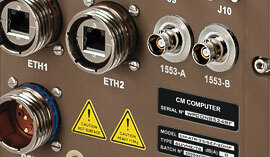 All CM 6U ATR chassis are delivered tested, qualified and certified per Military Standards MIL-STD-461E & MIL-STD-810F. 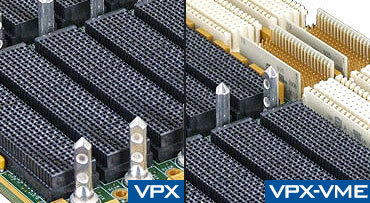 CM 6U SEF-HP military backplanes are available in VPX, VMEbus, cPCI, or combinations of VPX-VME64 or cPCI-VME64 hybrids, providing standard bus slot and signal daisy-chain functionalities. Designed to improve card-cage mechanical performance with 0.8 inch pitch slots & implement many features. 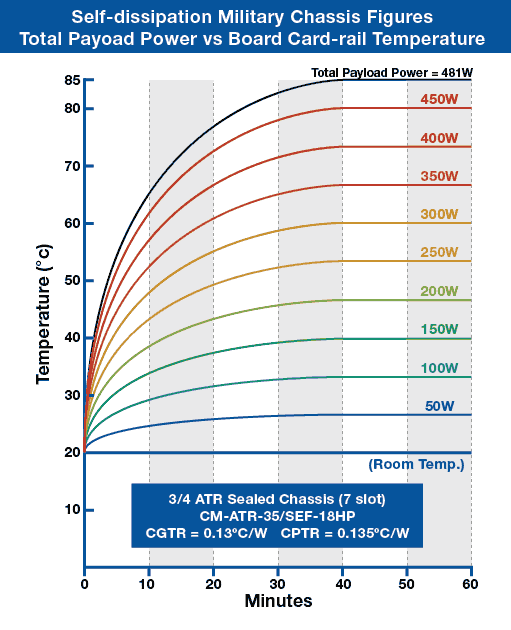 All SEF-HP backplanes integrate a Temperature Supervisory Unit (TSU) with panel LED (over/under temperature) that controls Power Supply & Fan operation. Remote optoisolated control switches for ‘Battle-short’ & chassis PSU ‘on/standby’ are fitted as standard. Final slots in 12 & 7 slot chassis allow for bus functionality & contain power/control provisions to accept a eurocard-size metallically caged Redundant PSU. 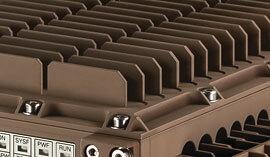 A single slot RPSU up to 575W operates in parallel with main PSU on a load-sharing basis to minimize component stress. 6U SEF-HP chassis PSUs support a wide variety of AC/DC input voltages (MIL-STD-704 & MIL-STD-1275) and customer defined DC power output combinations up to 1050 Watts. Available in different versions to suit input voltage requirments. To comply with MIL-STD-461E, a high capacity integrated EMI/EMC input voltage filter is fitted as standard on all 6U models. 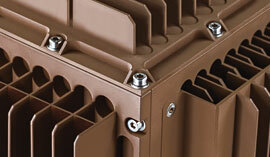 PSUs are custom made to match the enclosure mechanics. 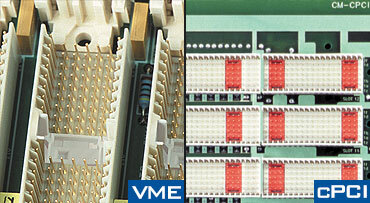 200VAC 3-Phase PSU versions incorporate AC/DC rectifier stage prior to the VICOR FIAM front-end modules. 6U SEF-HP PSUs incorporate isolated DC/DC converters & oversized hold-up capacitors to ensure proper operation during short power line failures. Outputs are protected against short-circuit, thermal-shutdown etc. The PSU in SEF-HP models is attached to the chassis rear panel, providing thermal conduction to the chassis frame & extended double finned air tunnels. The rear PSU panel on SEF-HP models incorporates 6 heat pipes to increase DC/DC converter heat removal and dissipation to the external environment. Internal air recirculation dissipates heat generated via convection cooling that inturn is conducted through all chassis panels. 6U SEF-HP Extended Fin chassis + Heat Pipes are fully sealed with no exterior exhaust fans, requiring Zero maintence & replacement of parts. Removable Extended Fin Top Cover fitted as standard for superior cooling. 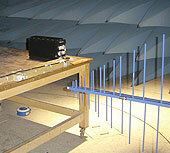 A low profile cover is available but with reduced dissipation capacity. All 6U chassis incorporate a low profile internal fan pack to recirculate air, improving card-cage, PSU & module heat dissipation. Fitted with extended double finned side walls and extended fin top cover + 18/20 integrated card-cage heat pipes with exterior airflow tunnels. 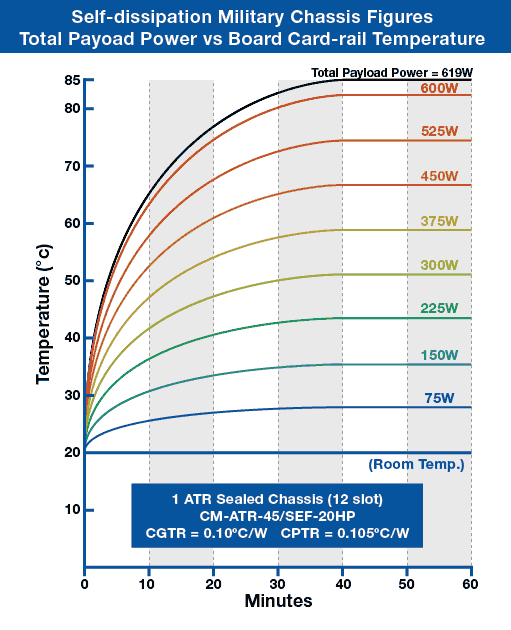 CM-ATR-25: ½ ATR - 5 Slots (0.8" Pitch). 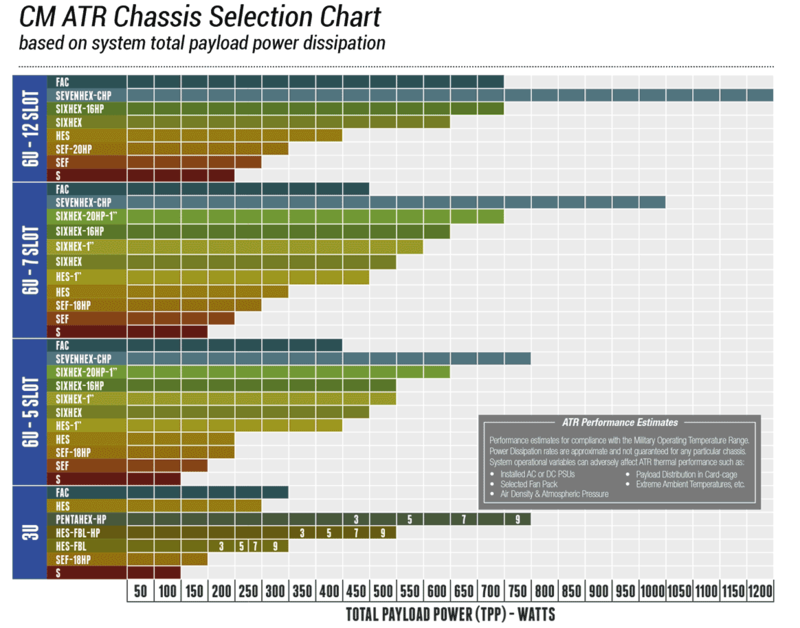 CM-ATR-35: ¾ ATR - 7 Slots (0.8" Pitch). CM-ATR-45: 1 ATR - 12 Slots (0.8" Pitch). 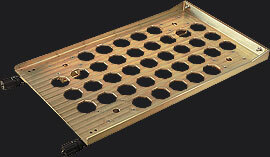 SEF-HP: Sealed (0.8” pitch) enclosure with Extended Fins + 18/20 Heat Pipes. 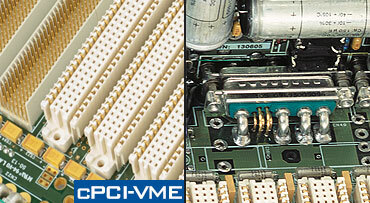 cPCI/VME64x: Hybrid cPCI mixed with VME64x Military Backplane. 90-264VAC: Autorange 90-264 VAC @ 47-880Hz Input. 200VAC-3Ph: 200 VAC 3 Phase @ 47-880Hz Input. 300W: 28 VDC (+5 VDC @20A, +3.3 VDC @5A, ±12 VDC @8A). 400W: All PSUs (+5 VDC @20A, +3.3 VDC @5A, ±12 VDC @12A). 400W: 28 VDC (+5 VDC @40A, +3.3 VDC @5A, ±12 VDC @8A). 500W: All PSUs (+5 VDC @40A, +3.3 VDC @5A, ±12 VDC @12A). C-575W: 28 VDC (+5 VDC @20A, +3.3 VDC @22A, +12 VDC @25A, -12 VDC @8A). C-625W: All PSUs (+5 VDC @20A, +3.3 VDC @22A, +12 VDC @25A, -12 VDC @12A). D-550W: 28 VDC (+5 VDC @40A, +3.3 VDC @45A, ±12 VDC @8A). D-650W: All PSUs (+5 VDC @40A, +3.3 VDC @45A, ±12 VDC @12A). 950W: 28 VDC (+5 VDC @80A, +3.3 VDC @45A, ±12 VDC @16A). 1050W: All PSUs (+5 VDC @80A, +3.3 VDC @45A, ±12 VDC @21A). D2: Optional user defined output DC/DC converter on backplane. FTC: Low Profile Top Cover with extended cooling fins. Fitted as standard. ‡ 20mm. SBC: Standard Bottom Cover. ‡ below backplane 25mm. HBC: High-profile Bottom Cover. ‡ below backplane 50mm. 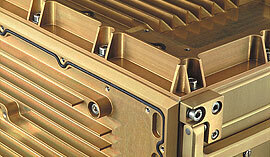 CCS: Conducton-cooled Card-cage slots (conduction-cooled boards only). 3/4 ATR, 7 slot, 6U VMEbus Avionics Enclosure. Sealed Enclosure with Extended Fins + 18 Heat Pipes. 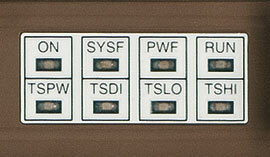 Extended 7 slot cPCI Backplane for 6U boards fitted with I/O on P3, P4 and P5 connectors. 28VDC input Power Supply Unit with 400W (+5VDC @40A, +3.3VDC @ 5A, ±12VDC @ 8A). (+) 3.3VDC @ 22A DC/DC converter on Backplane. User defined Front Panel layout. 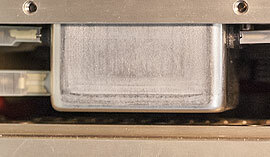 Standard low-profile top cover with extended cooling fins. 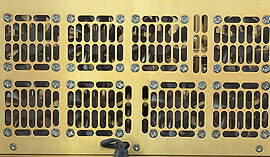 Conduction only, conduction-cooled card-cage slots.